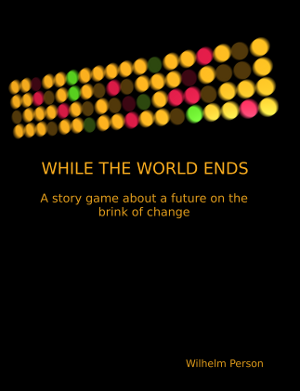 I mentioned that I played While the World Ends at GothCon XXXV. One of the players wrote a play report after the con, and then offered to run the game herself at one of our potluck minicons. 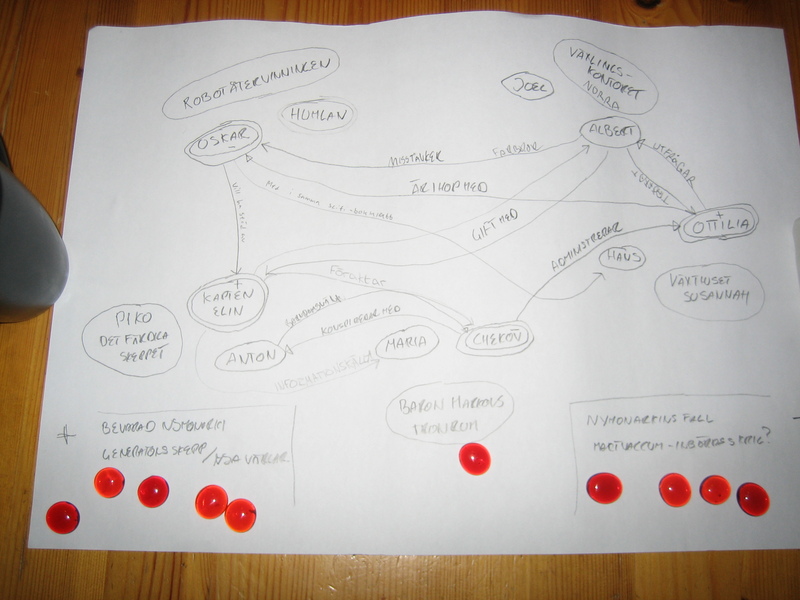 The con took place last weekend, and they played using a computer instead of plain pen and paper, which lead to the impressive diagram that can be seen below. I think this is the first time that someone has played the game using a computer, and I must say that I hadn’t even thought about it before I heard about this session after the fact. 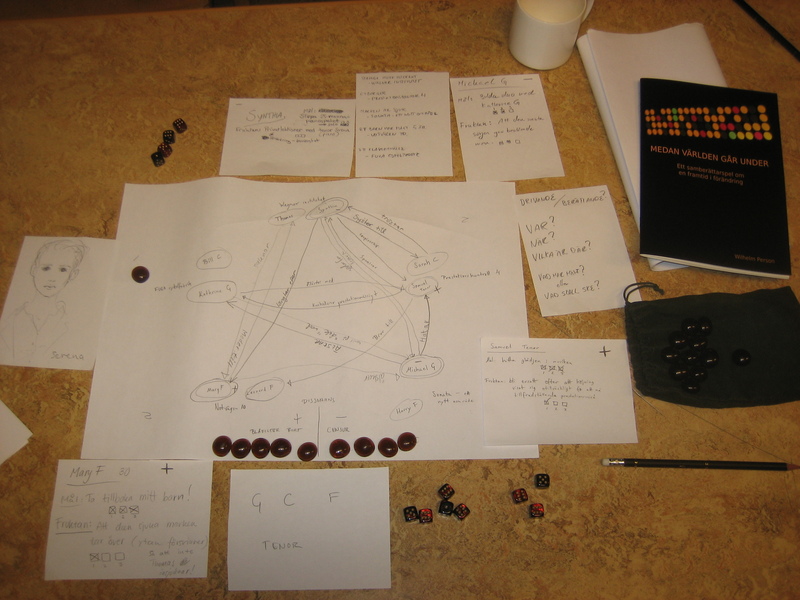 For a more ‘traditional’ view of what the game might look like during play I recommend the report from the session I played in at SävCon X earlier this year. Kareina also wrote another play report and I repost it here with her permission. The report contains a detailed account of how they did the prep with setting and character generation, and how play then proceeded. Friday we had a couple of people over for a gaming night as part of a mini gaming convention that a friend of ours runs. 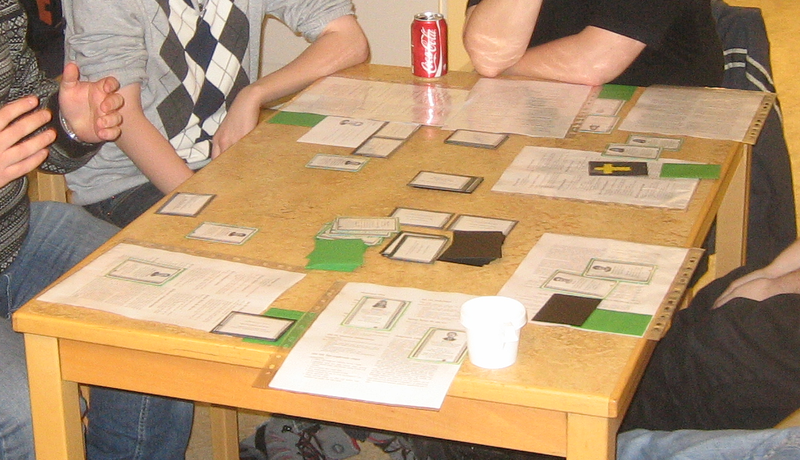 Sadly, our weekend was so booked we got to play in only the one game, but it was quite fun. We played While the World Ends, which was written by the guy who organized this mini con. This is the game we played at Gothcon early this month that I so enjoyed. It was fun this time, too. One of the other players is totally new to gaming–he knows some of our friends through a Japanese style sword technique class, and they were talking about the con, and suggested he give it a try. The set up part of the game, where we build the world and set up the general plot normally takes 30 minutes, but with a new gamer and talking about the sorts of things that could be done meant that we spent two hours on that part, but it was a fun two hours. Psychics: Secret Military Training Center for children with mind powers such a telepathy and telekinesis etc. The next step is to brainstorm a list of ten character names, which are assigned to the five locations (two each). Then each of us (four players) chooses one of those characters to play, and we determine a goal and a fear for each of the player characters. 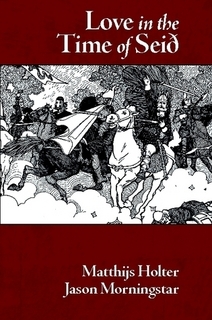 My character was based in the opposition headquarters, and my goal was to use propaganda to win over 30% of the undecided populace to our side in the the civil war in an attempt to thus win the war, and my fear was that failure to do so would result in needless bloodshed as part of the war (it would be possible to have a personal failure, but have the war’s goal of preventing that technology triggering an eruption succeed, but more people would die in the process). One of the other characters was based on the smuggler’s ship–she was an escaped psychic whose goal was to rescue her brother from the military training center, and whose fear was getting re-caught herself. The two of us were on the “positive” side of the game–should we “win” the story’s conclusion would be that the new technology would be implemented in such a way as to prevent all future volcanic eruptions and keep the planet safe for humans. 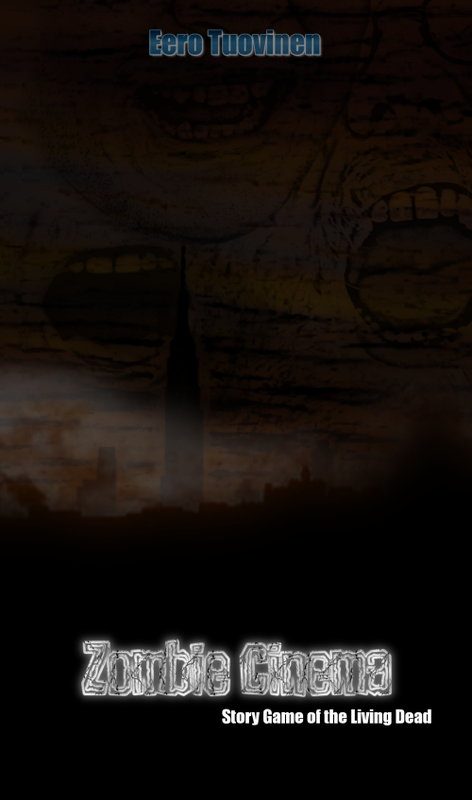 The other two characters were on the “negative” side–if they won then the use of that new technology would trigger the eruption and destroy the capital city. One of them was based at the hydrothermal plant, and her goal was to be the person who got to implement the technology (putting her own career goals before such minor issues of safety procedures). Her fear was screwing up and losing her job and someone else gaining the glory to be had from being the one to implement the technology. The final character (played by the new guy) worked as a trainer in the military center, and her goal was to discover the “leak”–what/who is causing some of the children in training to disappear. Her fear is a mass escape on the part of many students at once. Once we had our characters and knew which ones were on which side (it is necessary in this game that there be two on each side) we revealed the first few relationships between the characters. Each player character starts out the game with a relationship to one of the player characters on the other side, and to one of the NPCs. The two I choose were that my character is the ex husband of the scientist who wants to implement the technology, and is currently dating the captain of one of the ships over at the space port. One of the other characters chose to reveal that his character is the cousin of mine. Finally we could begin play. This is done by taking turns creating scenes–for each scene we tell who is present, where they are located, when the action takes place (the timing of the scenes can wander both forward and backwards in time, as we see fit), and what just happened. In order for a named character to be present they must either be associated with the location, or must have a revealed relationship with a character who is associated with that location (so at the start of the game my character could be present in the Opposition Headquarters, the Hydrothermal Processing Plant, or the Spaceport. Colour-building scenes–ones where the plot is developed, but nothing happens to further our character’s goals. Every time we choose to do one of these we gain a token. 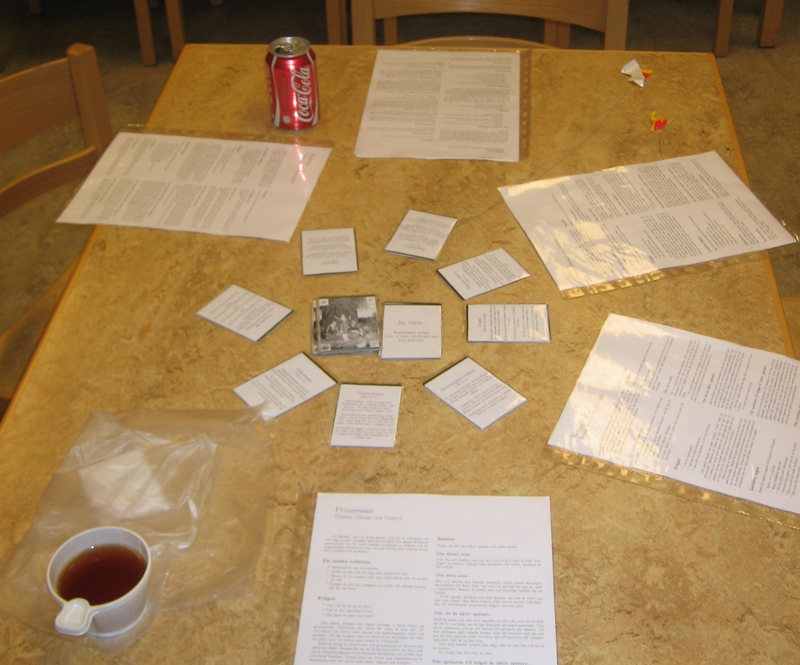 That token may be used by either of the players on that side to reveal a new relationship between characters. Each relationship is a one-way arrow connecting two characters, and is described with an “is” statement that shows the direction of the arrow. “R is the ex of J” means that the arrow points towards A. This is important for the other type of scene. Goal scenes–ones wherein the character performs an action that is intended to help them achieve their goal. 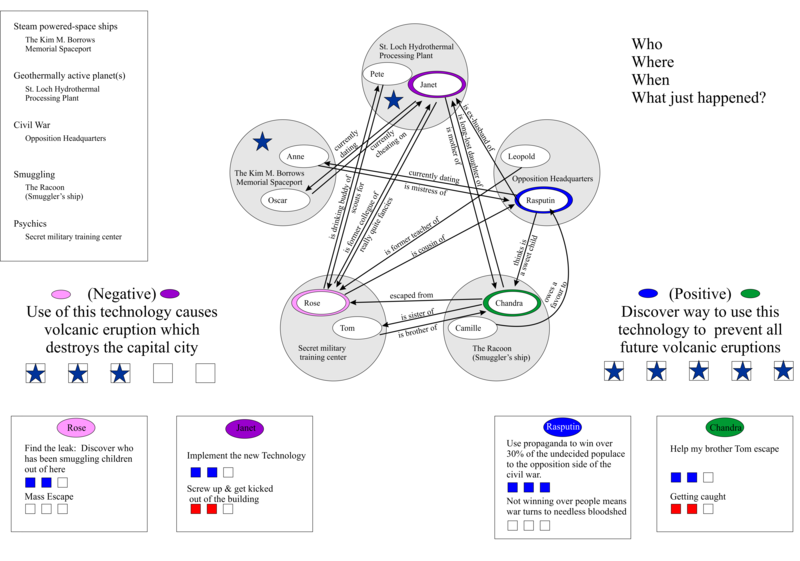 In these scenes, like in the plot-developing scenes above, any non-player characters present are played by the players, dividing them up so that there is someone playing each character. 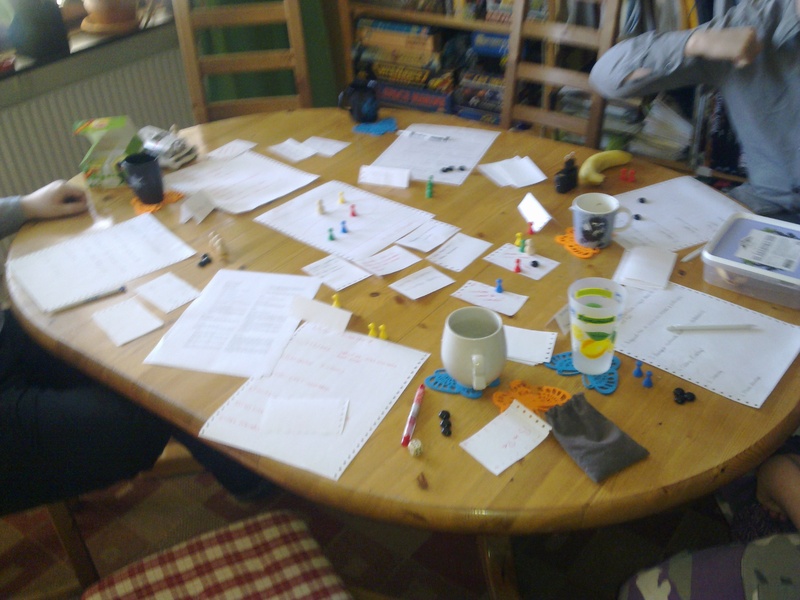 After setting the scene the players play the action until reaching the crisis point–in one of my scenes I was attempting to convince the pilot of the smuggler ship (an NPC) that she wanted to help the opposition cause by dropping leaflets full of my propaganda over the city. After some conversation it is necessary to decide if I am successful or not–this is where the “game” part comes in, with dice rolling. Each character is alloted a number of dice, which can change over the course of the game. We get one for being a player character, and another for each relationship arrow which points towards us. A successful die roll is rolling high (4, 5 or 6 on a six-sided dice). We start the game with three dice each, which means that it is very likely that we should be able to achieve at least one success each time we roll the dice (but, of course, we might not). Each player needs to complete three steps towards their goal in order to achieve their goal and win the game, but it gets harder each time. The first time one needs to roll one success (if you don’t you move one step closer to your fear instead), the second time one needs to roll two successes, and the final time one needs to roll three processes. 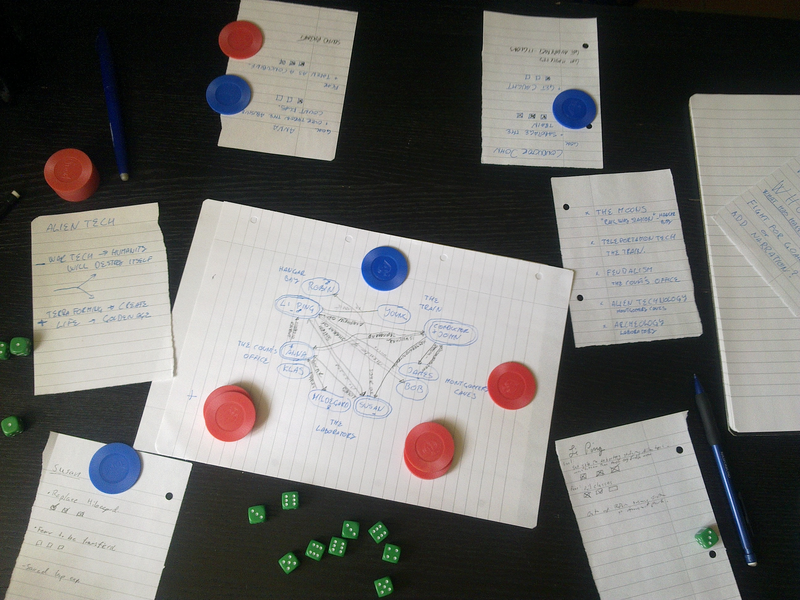 Needless to say, it would be possible to do this without revealing new relationships (and thus gaining more dice to roll each time), but the odds say that it is more likely that instead one would tick off all of the steps to failure, instead. This is the motivation to doing the plot-developing scenes, so that one is able to reveal more relationships between the characters in such a way as to get arrows pointing towards the ones who can help with one’s goals. Our game this time stayed fairly evenly matched at first, with each side gaining tick marks towards winning at about the same rate. Then they did a goal scene that resulted in a failure, and I managed to achieve my final goal which both won me the game, but also gave my side a total of the five points needed have our side triumph. As a result the civil war was resolved relatively bloodlessly and the new technology was implemented with all safety measures intact, preventing the volcanic eruption. After that there is an epilogue, wherein each of the other characters does one final scene to determine if they also succeed in their goals and what happens. In this case the other two players who were only one point away from achieving their goals failed, but the new guy had a successful epilogue, which brought him up to 2/3 of the way towards completing his goal, too. I just got back from GothCon XXXV, where I as usual helped hosting the Indie Gaming Lounge. The games we had brought. 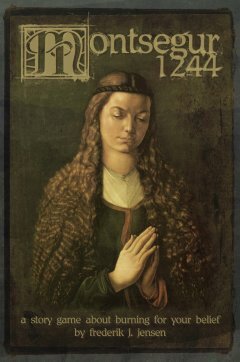 Photograph by Joel Möller. As usual we offered indie games, tea and candy on a drop-in basis. 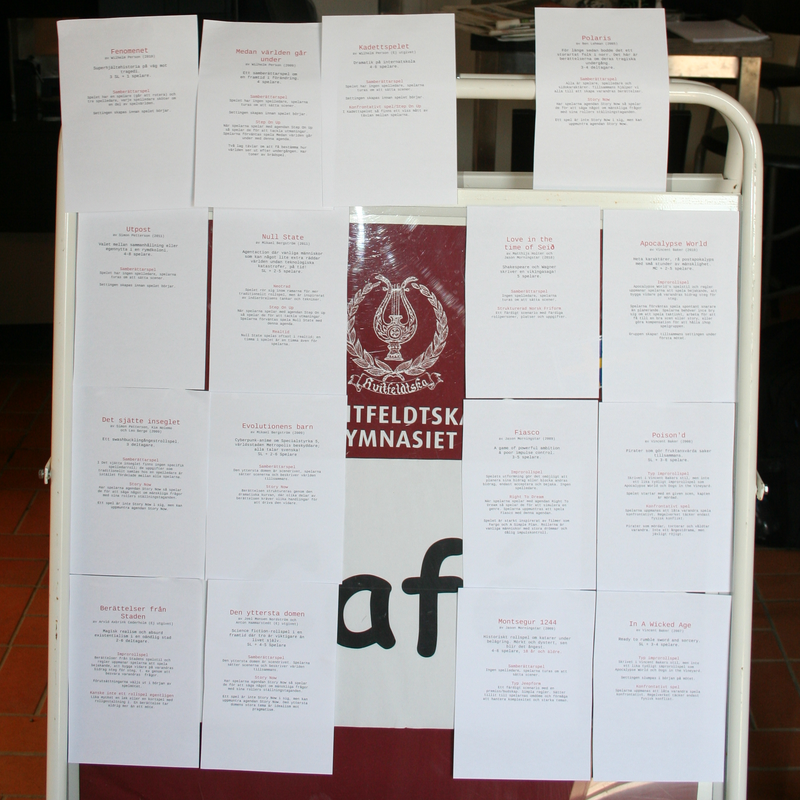 Popular games this year were Apocalypse World, Berättelser från Staden, Den Yttersta Domen, Fiasco and Null State. The weather was great, the finest I have ever experienced at GothCon, so many games were played outside. I managed to do play tests of two of my current projects at the con, first a game of The Academy, the game formerly known as The Cadet Game. 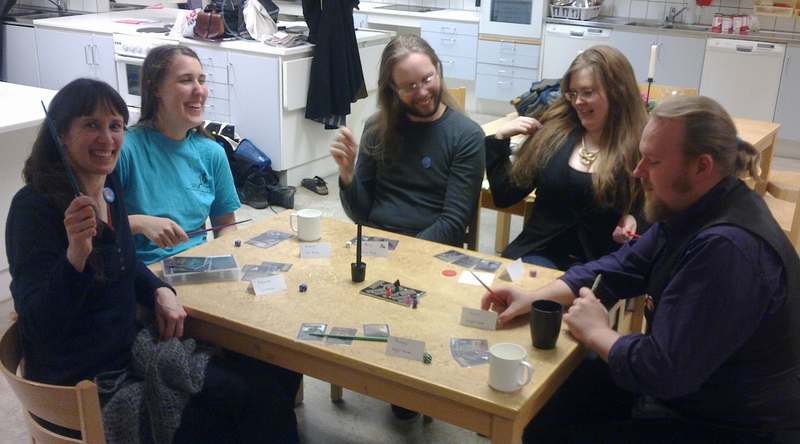 We tested the bounds of the game and played with six players. Yet we managed to both build an academy, generate characters and play through three years at an orbiting space station and do epilogues for all the characters in a four hour convention slot. It was fun to see that the game worked so well, and I got some valuable feedback on the flow of the game. 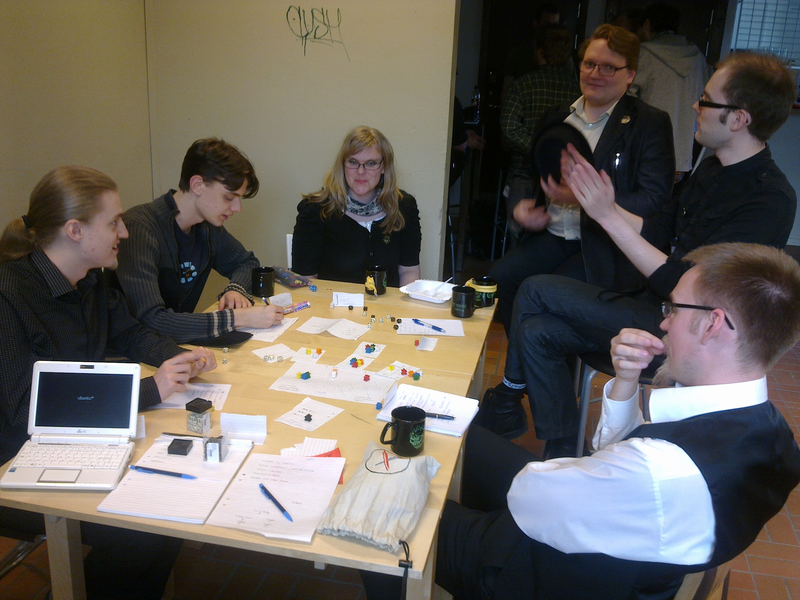 Then I played a game of The Phenomenon, a super hero story that turned very 80’ies era supers comic in the end. 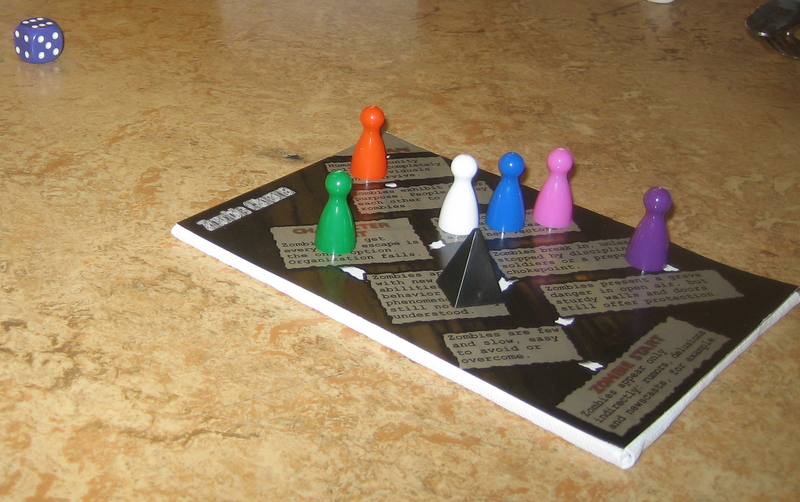 It was very different from the angst ridden Mummy game in the previous test. I think I have the balancing down now, and it feels good that the game actually works for many different types of stories as intended. I got some new interesting Swedish games with me back home, and I hope to get back to them on this blog later with Reading posts.